Colonel Alex McNamee and Deacon Gordon Weetch sealing the agreement with a hand shake. 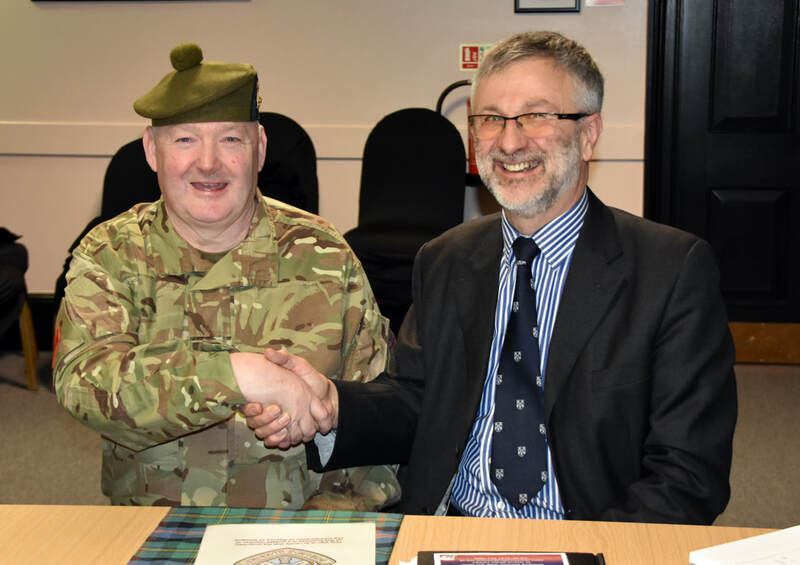 At a Master Court Meeting on Tuesday 13th November 2018, Colonel Alex McNamee, who is a member of the Incorporation of Masons, attended the meeting along with the Cadet Executive Officer, the Regimental Sergeant Major and two cadets from the Royal Signals Detachment, based at Jardine Street, Maryhill. 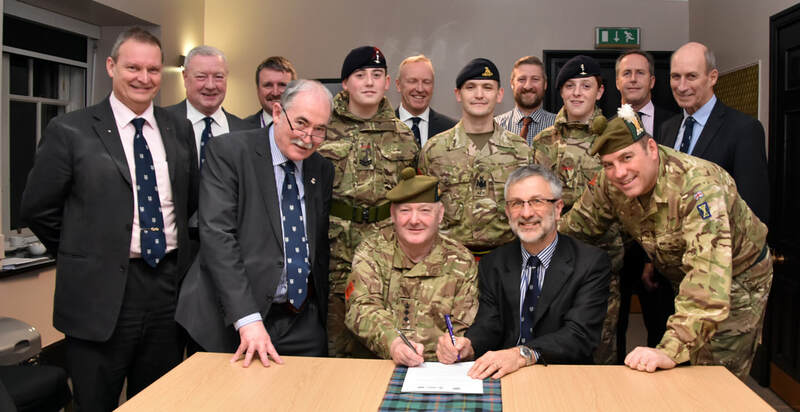 The reason for this auspicious group attending was to take part in the official signing of the Affiliation agreement between the Incorporation and the Battalion. Two cadets who will be chosen by the Battalion will each be awarded a monetary prize, certificate and commemorative item from the Incorporation. The two prize winners will be invited to attend the Deacon's Choosing Dinner in September and be accompanied by a person of their choosing. All Officers, Adult Instructors and cadets involved in the Construction Industry will be able to apply for the Lady McDonald Bursaries and the Lady McDonald Scholarships. All Officers, Adult Instructors and cadets will be invited to all Incorporation social events as if they were members. All Officers, Adult Instructors and cadets will be encouraged to become members of the Incorporation and Burgesses of Glasgow. The Battalion will invite members of the Incorporation to suitable events that they hold. At the Deacon's Dinner in September the two Lord Lieutenant Cadets in the Battalion received the prizes as above and attended the Deacon's Choosing Dinner along with some Officers from the Battalion and a number of the Master Court were invited to a Cadet Display at their Headquarters at Dechmont, Cambuslang. Collector David Taylor watches as Colonel McNamee signs the Affiliation Agreement and the Battalion Cadet Executive Officer watches Deacon Gordon Weetch signing as well. The Master Court along with the RSM and two Signals cadets look on with great pleasure.